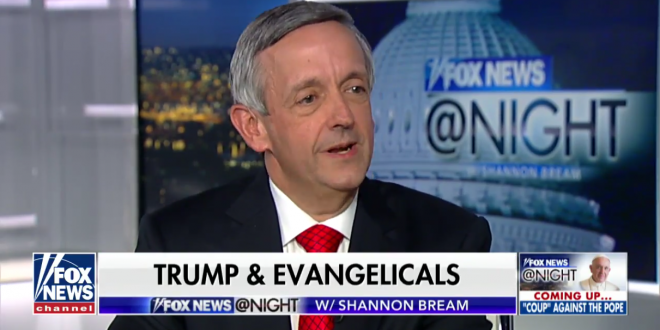 Robert Jeffress: Evangelicals Don't Care About Trump's Adultery, The Left's Shaming Is Not Going To Work - Joe.My.God. “I know a lot of people are still perplexed- why are Christians so supportive of Donald Trump? Well, it’s really not that hard to figure out when you realize he is the most pro-life, pro-religious liberty, pro-conservative judiciary in history and that includes either Bush or Ronald Reagan. I think that is why evangelicals remain committed to this president and they are not going to turn away from him soon. “To be fair, Shannon, we have to understand these are still allegations against the president, so I’m not going to judge the president on these things. But even if they were true, some of these allegations, I mean, obviously, we don’t support extramarital affairs, we don’t support hush money payments, but what we do support are these president’s excellent policies. And I think most thinking people can absolutely differentiate between the two.